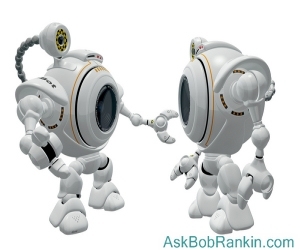 Here's how we keep artificially intelligent robots from taking over the world... Make them talk to each other. Adam Jakowenko, who owns both the Amazon Echo and Google Home gadgets, figured out how they could annoy each other, in an infinite loop. Or, there's the Liar's Paradox method. Yogi Berra famously said, “Nobody goes there anymore. It’s too crowded.” Now Google Maps is proving him right. By adding real-time crowd estimates to locations such as shopping malls, restaurants, etc., users can plan when and how long to visit. Or not. Elder geeks’ heads will turn when they see you with a 3.5” floppy disc that’s really a 2500 mAh power bank. Made by the UK’s ThumbsUp, the Floppy Disc Powerbank comes with a USB-C connector to charge your devices. Pricing is not yet available. Speaking of floppy disks... how do you make sure nobody can access the data on your old disks? The obvious answer for David Kronstein was to destroy them with an inverted lawn mower, and film the process at 11,700 frames per second with an array of high-definition video cameras. You can see the carnage in this slow motion video. The LingLong DingDong is China’s answer to the Amazon Echo, or another shameless ripoff of American tech. But a joint venture marrying Amazon’s Alexa AI with DingDong may be Amazon’s best shot at the huge and government-protected Chinese market. What comes after Z? Cisco Systems says total Internet traffic will exceed one Zettabyte this year. A ZB is one billion gigabytes, or the capacity of 20 billion Blu-Ray discs. The one billion sites on the Internet average 2.3 MB each, and the size of each page is growing rapidly. Bandwidth is not increasing fast enough; site designers need to become more efficient. Starbucks is selling - or trying to sell - a $150 smart coffee mug that lets you precisely control the temperature of your brew via a smartphone app. Twitter has told law enforcement agencies to stop using its service for surveillance purposes or risk having their accounts and access to Twitter’s API suspended. Two data-mining companies have been booted from Twitter for helping law enforcement track Twitter users. For just $39, you can buy a sophisticated ransomware platform that puts you in the extortion business. The Stampado ransomware is self-propagating, can infect networked devices and removable drives, and encrypts files that are already encrypted. (Pssst… if Stampado encrypts your device, try the Stampado decryptor tool from Emsisoft. Most recent comments on "Geekly Update - 01 December 2016"
That's some incredible video footage of a lawn mower attacking old 3-1/2" floppies. However, as you can see throughout the video and especially at the end when the camera pans the floor, this wasn't a particularly effective way to destroy the content. Mostly it was a demonstration of "How to Rip Open an Old Floppy While Leaving the Magnetic Mylar Disc Intact." I couldn't recover data from one of those flimsy disks that look like a miniature 45 RPM phonograph record ("Hey, kids, remember those? "), but I bet there are many companies that could. Nevertheless, a great video, though more for watching extremely high-speed motion at an extremely low speed. My grandkids in particular enjoyed the spectacle of my recent destruction of many old floppies. First I separated the two halves to get to the plastic disc. I then painstakingly cut them all in to very narrow strips keeping each strip separate from the others. Each pile of strips, from the same part of each disc was gathered up individually and given to different family members for disposal in their trash, two even went to a different state. Amazon Echo/Google Home gadgets: That was brilliantly done! Wanted the unique conversation to last longer - rather than one phrase repeated; but still, wonderful! Driver's Phone: If texts are 'disabled', I sure hope they are buffered somewhere for later delivery. My iPhone looses ALL txt msgs if I put it in 'Airplane Mode' - which it's NOT supposed to do. So simple to control the phone and texting while in an automobile. Build interference to signal receipt within the computer so that although one may hear a tone for an incoming call, it can be returned only after the vehicle is stationary with the engine not running. All that is required is the legislation to to have the auto makers comply. $150 for a coffee mug??!!?? Are people nuts? It's a lousy cup of coffee!! Interesting problem in how to determine the phone user in a moving vehicle is the driver rather than a passenger. So some lady in her car is being pursued by a felon, and she can't call for help on her cell phone? And someone following a car full of criminals can't call the police to tell them where the bad guys are? Seriously? That idea about disabling phone functionality while driving is marvelous since so many people can't muster the necessary common sense to do it themselves. As per federal law even a disabled or disconnected phone can call 911. That lawn mower video although impressive would have been more interesting and effective if the blades were sharpened so they would actually cut instead of smash their way through and been painted to provide better contrast. If two pattering bots is the state of the art in AI then we have no worries about them taking over the world. Besides we can always just pull the plug, can't we? And yes that is a lousy cup of coffee.